Registered nurse Liberty Hunter shares how family rose above daughter’s autism diagnosis in new book. I really hope to stimulate conversations about tolerance and inclusion for children who are different. Even though about 1 in 68 children is diagnosed with autism according to the CDC, young parents struggle to deal with diagnoses of their young children. The news that her daughter had autism forced Liberty Hunter to make substantial changes to accommodate her daughter’s needs. 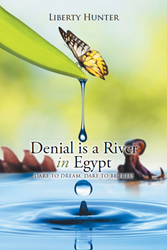 In “Denial is a River in Egypt,” Hunter documents her journey through the eyes of Indy, a new mother who must deal with the challenges of raising an autistic daughter. As she puts her life goals on hold to care for her daughter, Indy comes to the realization that her life will never be the same. Hunter details Indy’s delight in watching her daughter grow, her struggle of acceptance with the school system and the personal and marital toll autism takes on her life. “I really hope to stimulate conversations about tolerance and inclusion for children who are different,” Hunter said. Hunter’s experience raising her own autistic daughter contributes to the realism of the story. In it, Hunter explains her familiarity of weathering adverse circumstances while also providing hope and encouragement to other families afflicted with the disorder.